Mac users often encounter internet-related security threats. Intego, which has been offering security products for Apple users since 1997, aims to help users keep such security threats at bay with one of its premium products, the Intego Mac Premium Bundle X9. Owing to the software development firm’s involvement in Mac security since a pretty long time, Intego has been quite aware of the security issues such as viruses, phishing, and malware programs that make life difficult for the average Mac user. As a countermeasure, the software developers have come up with a cutting-edge security product and they have named the security suite Intego Mac Premium Bundle X9. Cyber criminals never stop inventing methods to gain access to Mac systems. As far as opting for an antivirus software program is in question, the primary aspect that should be taken in consideration is that the security tool must work as an anti-phishing, antispyware, and antivirus program. Intego Mac premium Bundle X9 is a comprehensive solution which can help Mac users thwart any kind of attempt to access or tarnish their data. Apple computer users often stumble upon counterfeit websites which ask them to provide personal and sensitive information such as online banking details, credit card or debit card numbers. Intego Mac Premium Bundle X9 is a Mac security antiphishing and identity protection software which was designed to help Mac users in blocking various kinds of spyware programs too, including phishing ads and banners. It promises to help users discard any malicious file or information that can be harmful. ‘Macs can never get harmed by viruses’ – this is probably the biggest lie most Mac users believe in and are often misled. Many users are of the opinion that antivirus software programs are redundant. However, all sorts of computer systems are prone to virus damage and cyber criminals deploy all kinds of malware programs you can imagine to target Macintosh systems. Along with your computer, your money and your personal information may also get under serious threat. Intego VirusBarrier, which comes with the all-inclusive security suite, helps users safeguard their data and system from malware programs. It is indeed an award-winning antivirus software program designed for Mac users. 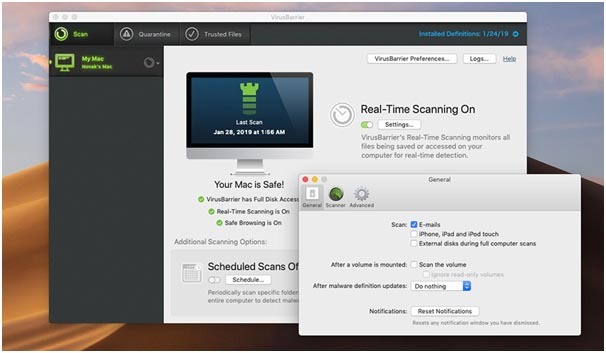 VirusBarrier brings antivirus protection in real time and executes a thorough scanning of the files whenever they are being accessed in order to discard malware from your Mac. Latest updates are automatically checked just to ensure the user gets adequate protection against the latest threats. Aside from Macs, Intego VirusBarrier also detects malware in Windows PCs, so as to prevent you from distributing infected files to your family, friends, and even colleagues. 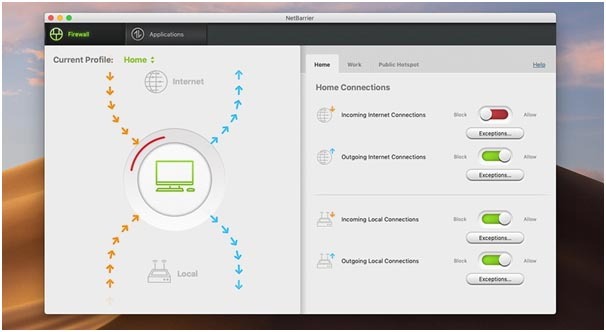 Net Barrier is a Mac network protection tool which comes with the Intego Mac Premium Bundle X9 security suite. It protects your system from any unauthorized access. 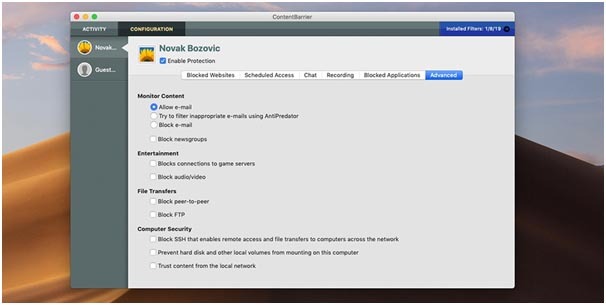 Contrary to popular beliefs, when you are connecting your system with the internet, your Mac becomes vulnerable to intrusion. For the cyber criminals, getting an access to your private information is a complete cakewalk. For them, it’s all about an IP Address and open ports. NetBarrier from Intego blocks unwanted access and helps the user maintain a safe distance from the cyber criminals. Whether you are at your office, in a cafe, or travelling to a meeting or a conference, NetBarrier is always aware of your location and automatically switches to the apt firewall setting to provide you with best possible protection. It also helps in identifying all the devices that are trying to get an access to the user’s Mac and makes sharing files with others peaceful and easy. As a matter of fact, Intego NetBarrier is a two-way firewall that furnishes the best anti-spyware measures in order to shield any kind of data that you are sharing with someone via your Mac. ContentBarrier is Intego’s tool which keeps kids safe from online threats. The internet may be sort of a minefield for your kids. Of course, your children gather an ocean of information from the web. However, they are always just a click away from criminal-minded people and unsuitable websites. Intego’s tool is a parental control solution that helps you in creating appropriate boundaries for your children, teens or toddlers notwithstanding. Users do realize how important it is to keep their little ones away from adult and gambling sites. ContentBarrier is a great tool which can block out certain websites with objectionable content and stop your kids from getting acquainted with them. Aside from that, users can also set aside a list of some approved websites that are suitable for your children. Users must also realize that no two kids have the same level of maturity and they might need to access the internet in a different way. ContentBarrier plays an important role here as it provides customized parental control settings that suit the needs of each member of your family. It also allows parents to restrict the duration their kids can access the net. All in all, you can keep a keen eye on sites your kids visit. Personal Backup aids in protecting the important files in case of a disaster. A proper backup plan is imperative, especially in situations when there is a computer meltdown. 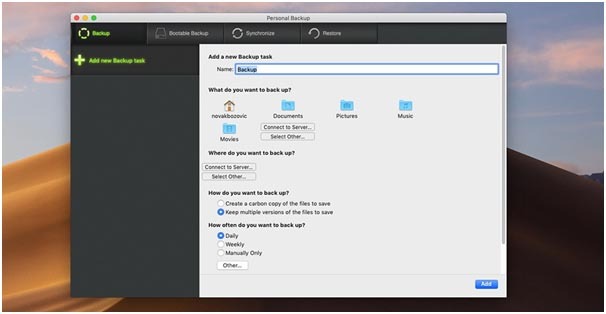 Personal Backup from Intego creates a number of backups by copying changed or new files and even allows you to schedule your backups. Backups are faster and you don’t require launching it every time. This protection will make sure you don’t lose out on significant files. In cases of theft or data corruption, Personal Backup provides an easy and efficient recovery. It gives you total control of your files. If you are having two MACs, this feature helps in synchronizing folders between them and ensures that both the MACs have the latest and updated version of each and every file. In addition to that, Personal Backup is known to create bootable clones and store them in an external hard disk. This is useful, especially when you want to boot from the backup and get an access to your files. It wouldn’t be an exaggeration to say that even Time Machine doesn’t possess this particular functionality. Mac Washing Machine is a Mac cleaner that helps you in getting rid of all junk files like duplicate files and programs that can slow your Mac down. The tool also aids in organizing things automatically and boosts the performance of your Mac. In case you are having excess clutter on your disk, MAC Washing machine is indeed helpful. It has a nice interface, presets for Downloads, Logs, Languages, and Trash. The scan area is pre-defined and hence, the scanning time reduces. The Mac cleaner is a pretty nice feature in the comprehensive list. It is also loaded with anti-phishing, antivirus, anti-spyware, and firewall network protection. Hence, such a solution is equally competent in blocking Trojans, malware, and virus. This implies that Mac Washing Machine X9 can not only discard all junks and boost the system, but also protect your data from online threats. It possesses cleanup and optimization features, which make Mac cleaner absolutely indispensable. Intego MAC Premium Bundle X9 vs Norton Security Premium Comparison: Which One Should You Choose For Your Mac? Norton Security offers a bunch of security solutions to Mac users, including but not limited to Norton Security Standard and Norton Security Premium. The security suite does offer some of the most basic protection features, including anti-malware, antivirus, and anti-ransomware. It also offers almost the same set of features as Intego, including Parental Conrols, Backup and more. However, the security software lags behind one of its primary competitor – the Intego MAC Premium Bundle X9 on one or more aspects. In fact, we didn’t notice any significantly negative impact while testing the software application on a Mac, but it slowed down the system by a meagre 3%. The user interface is quite simple, as most of the features are placed right on the home screen. Also, you can reach out for technical assistance right from the home screen. However, it is a relatively pricier option and does not cover all the basics. Intego Mac Premium bundle X9, on the other hand, comes with a comprehensive set of features (as we have discussed above). In our AV-TEST, the software was able to detect 100% of Mac-based malware samples. However, we especially liked the additional features that come paired with the main security solution, including anti-malware and anti-virus protection, on-demand and instant malware scans, quick scan and full-system scan options, flexible malware removal options, and email notifications. It almost didn’t impact our system performance, which is the best part of the software application. Here’s taking a closer look at the two software programs side-by-side. It provides a comprehensive protection for your Mac device. It comes at a very affordable price and thus availing it for a high-performance security solution becomes easy. It furnishes an extensive suite of cleanup, optimization, and internet security for Mac device. It primarily lays on emphasis on blocking objectionable contents for the children at home and aids parents to keep a keen eye on their kids’ online activities. It helps in cleaning up the entire system with the Mac cleaner feature. It takes an automatic backup of all the data in cases of a system meltdown or a sudden crash. It shields your Mac from online threats irrespective whether you are travelling or at home. It protects all your sensitive and private data from hackers and cyber criminals. It is quite effective when it comes to detecting Mac virus, but not equally effective at detecting Windows malware. The Mac antivirus scanner takes a bit longer than other applications as far installing is concerned. Intego checks the web browsers and then makes you aware whether the safety features are on. It doesn’t possess its own safe browsing attributes. Intego doesn’t identify Windows malware. Intego Mac Internet Security is actually a basic antivirus program, but not an extensive protection suite. It doesn’t support password managers, safe banking features, or a VPN. Intego Mac Premium Bundle X9: What The Users Are Saying? It seems the overall impression about the Intego security solution for Mac has been a positive one. Rudi Moreck, a Florida native who has been using the security solution for quite some time now, recently wrote on Facebook that he has faced zero performance issues while using the software product. He has also mentioned that he has been able to keep viruses and malware at bay using Intego Mac Premium Bundle X9. Grant Brown, another user, has been using the software product since 2015m, with no issues whatsoever. However, one Sakda Phongkasetkarn suggested that the software solution be made available for Opera browser as well. In comparison to the other home products launched by Intego and some of its top competitors, Premium Bundle X9 is a more comprehensive protection for your Mac. The software is effective when it comes to cleaning up your system and protecting it from online attacks. Moreover, its affordable price is its unique selling point. If you decide to try Premium Bundle X9 don’t forget to use Intego coupon codes as you can save upto 41% off from the original price. The information provided here should be enough for users if they have a keen interest in acquiring the security software. Users would find additional information on the official website and can even download the trial version.